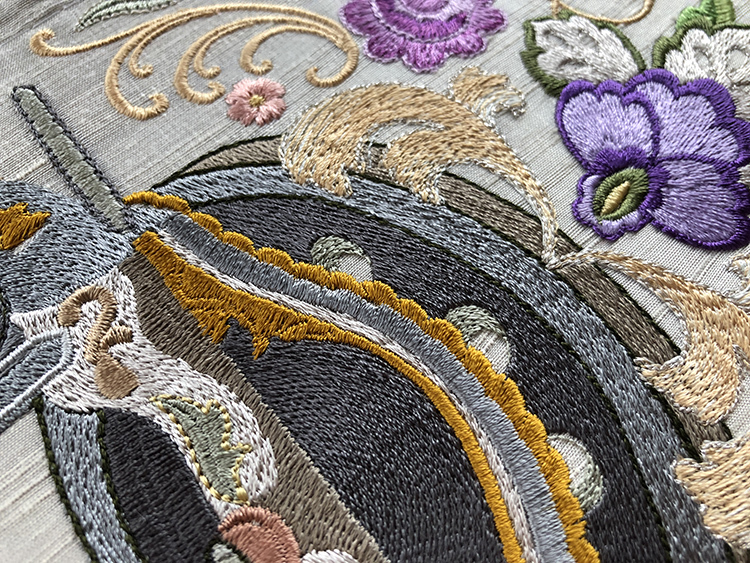 With the launch of my new website, I have been planning the release of my best design set ever, comprising an antique sewing machine with pretty scroll work, perfectly beautiful fuchsia flowers, delightful roses, along with some outstanding blending of threads. This very special set has been a great labour of love over several months, not only for the actual digitising where I have tried to incorporate new fills some of which are blended, but also in the choice of colours. 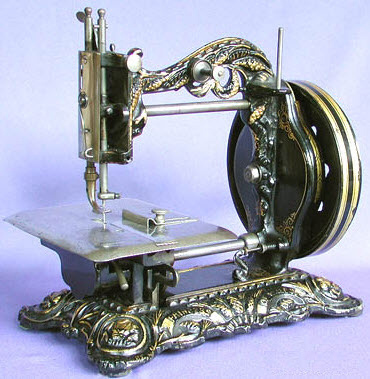 After searching the internet I was thrilled to discover that this particular cast iron lock stitch machine was called the Princess of Wales, originally made by Newton Wilson & Co and that this more ornate version was made around 1878. 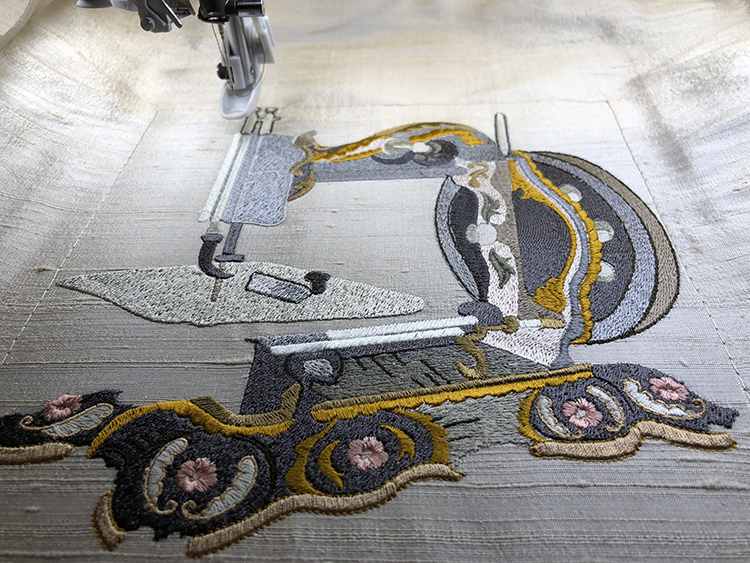 The actual machine can be stitched out on its own in an 8″ x 8″ hoop. The flowers each end are added using a 5″ x 7″ hoop. 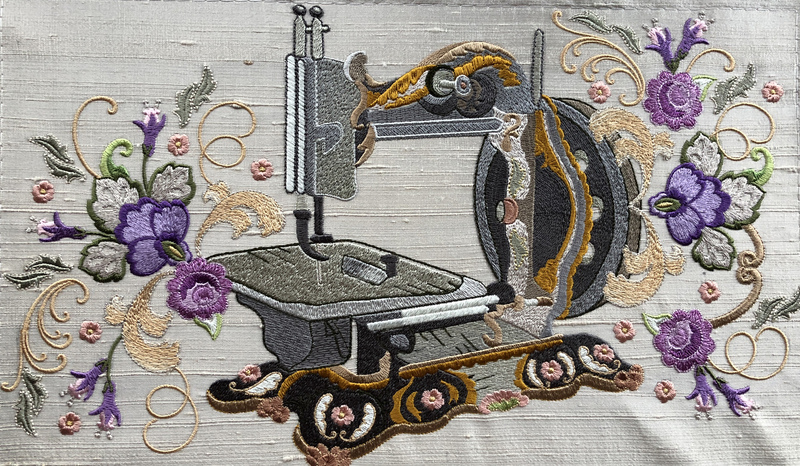 The whole machine along with the floral scrolls measures 7.82″ x 13.37″ (or 198.7 mm x 339.6 mm) There are at the moment 18 designs in this set, released today. I am looking into the possibility of splitting the machine for those who do not have 8″ wide hoops. Planning this design and assigning the colours has probably taken more time than any other design I have digitised, because I wanted this to be extra special. 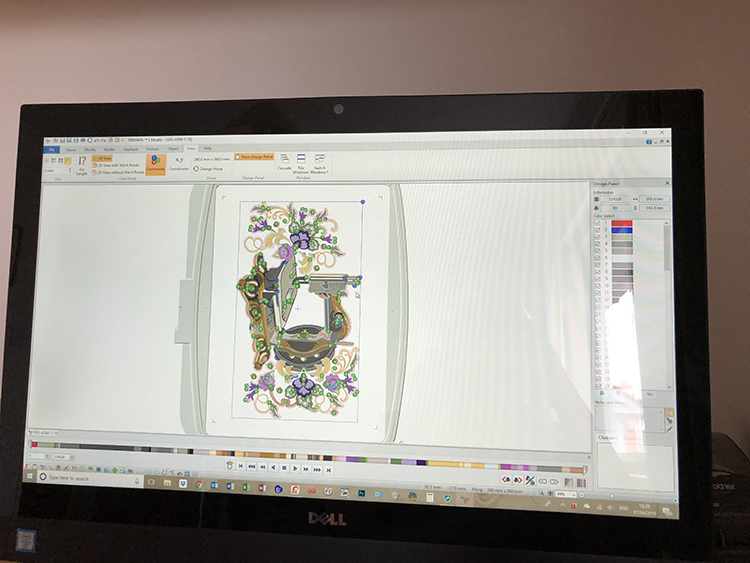 The designs have not been colour sorted and I have assigned different pinks, purples and mauves to each of the flowers so you can adjust the colours. 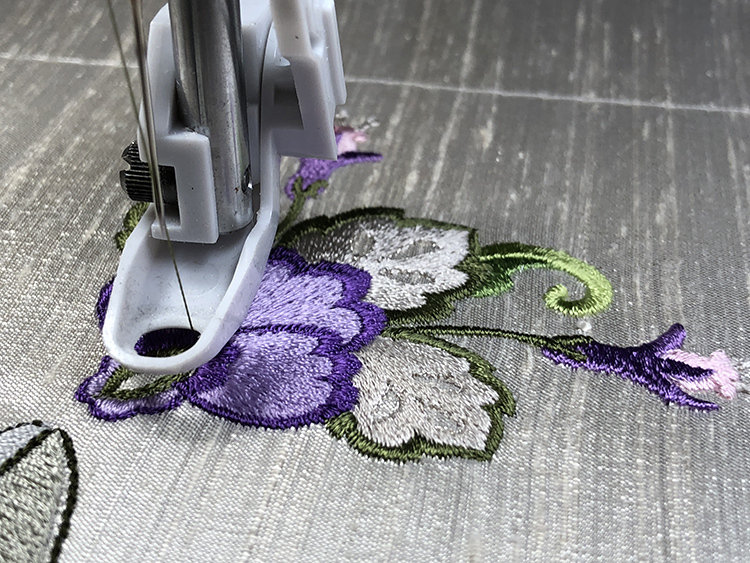 When you have decided upon your particular colour scheme then I suggest you save the design under a new name and colour sort it in your embroidery software if you are able. For my final stitch out I hooped up some very special slubby silk dupion, which is a shot silk comprised of cream and grey threads. This silk is so wonderful that it has been photographed and used as the backdrop of my new website. Notice that I have hooped my stitch and tear stabiliser, adding another layer from scrapes, and attached the silk fabric with temporary adhesive and a box of basting stitches. There are little clips holding the stabiliser in place on this Husqvarna 360 mm x 200 mm hoop. If you have something comparable do use it. 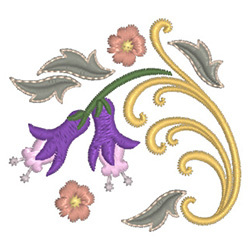 The preparation for embroidering this design should not be hurried. For something this big you want to get it right first time, and not waste the effort and the material involved. Set aside a good period of time, such as two afternoons or a whole day when you will not be interrupted. The time it will take you depends on many factors including your machine, so I will not make a guess, and I have to confess I lost track of my progress. My Epic shows the stitching takes 4 hours at maximum speed, but the thread changes will also use up considerable time. Here you can see the machine taking shape. Notice the deep golds that I have chosen for the scroll work and the pretty flowers which were a feature of this machine. Here you can see the close up details of the ornate leaves and the little fuchsias. The holes in the leaves are given an outline and I chose a silver metallic thread (Sulky Metallic 30 wt Silver) for this to emphasize them. I used it for the needle too. The scrolls are blended in two colours and are not dense so they sit well over the machine where there is an overlap. The fill stitches of the machine are curved so giving it shape. For my first stitch out I chose black thread for the outline and details of the machine but in the end I went for Sulky Rayon 40 wt 1836 Loden green. 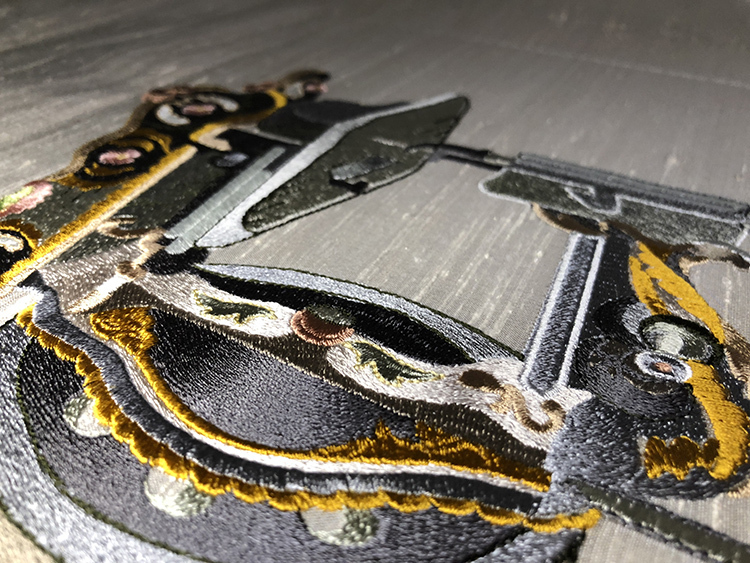 The greys and greens used for the machine were also Sulky Rayon, 40wt, 1219 Gray, 1220 Charcoal grey, 1180 Medium taupe, 1508 Putty and 1129 Light putty, with 1826 Galley gold and 1128 Dark ecru for the scroll work. 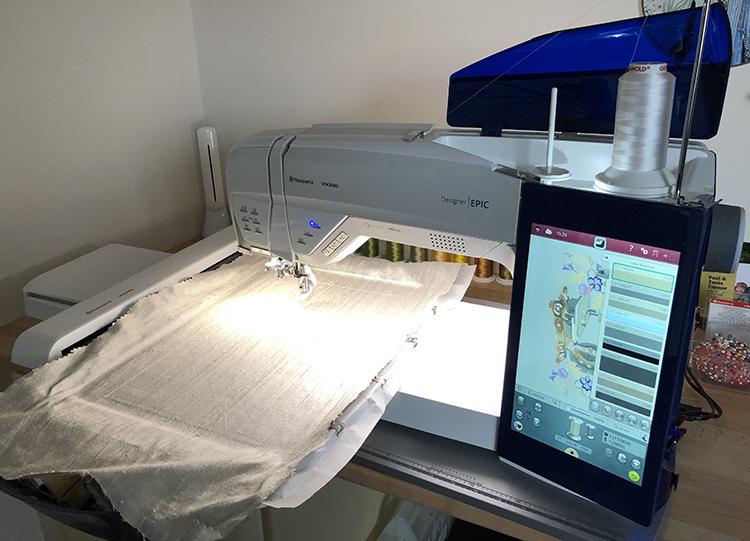 The results are well worth the time invested in stitching this out, being perfect for a framed picture in your sewing room, for a machine cover or a large tote for sewing classes. In fact with all the lovely designs in this set I am sure you could create a marvellous quilt with the machine at the centre. The freebie from this set is perfect for creating borders as it sits alongside itself. To find out more about the details of this design visit my new website and download the PDF of dimensions and colours. I hope you have as much fun with this one as I have had creating it. 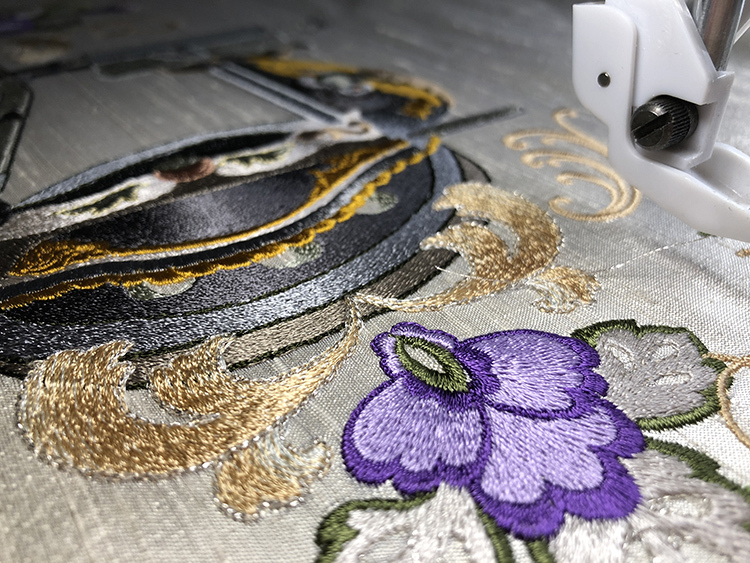 This entry was posted in Discussing machine embroidery, Embroidery projects, New Designs and tagged combining embroidery designs, development of embroidery, embroidery on silk, machine embroidery. Bookmark the permalink. Absolutely beautiful! Can’t wait to get this one! Looks outstanding is it for sale now ? Have just bought it and am thinking about stitching it and then attaching it to my Epic machine cover. Not sure how to do this yet. Start by embroidering it on larger than necessary piece of fabric as you can never make it bigger! I would make a”toile” first with some old fabric. Hi Hazel, this is a truly majestic design. Love the way you intertwined some of the same beautiful flowers from the decorative parts of your antique sewing machine into the flower arrangements that surround areas of the machine.. You have created a work of art in machine embroidery and the silk dupioni is the perfect vintage background compliment to set of the vibrant colors and metallic thread touches . I ordered the Antique Sewing Machine 1, signed in, selected Paypal but cannot activate that option? Check out the little tutorial on the update page. This design is absolutely amazing. It is so beautiful and you can see that there was a lot of love in this design. Awesome! I just find it so encouraging when you all make these lovely remarks about my embroidery.